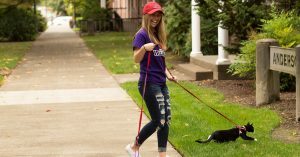 In the fall of 2019, Linfield College will designate the Jane Failing residence hall as “pet-friendly” and students can apply to bring their pet to campus. 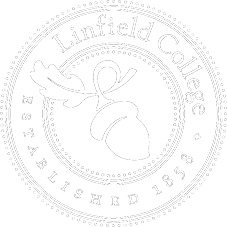 This makes Linfield College one of only a few colleges nationwide, and the only one in Oregon, to allow many types of pets — not just fish and small caged animals — in a residence hall. Students may bring small pets to campus, such as turtles, lizards, hamsters or gerbils; fish; or a cat or a dog that is at least six months old and has lived with the student for at least six months before coming to campus. Additionally, dogs brought to campus can’t weigh more than 40 pounds. All pets must be housebroken. Pets will not be permitted in campus buildings other than Jane Failing Hall. While on campus, all pets must be on a leash when outside the student’s room and must wear identification tags that list the pet’s name, hall and room number and the owner’s cell phone number. Linfield will not allow exotic animals, animals requiring a special permit under Oregon state law, or ferrets, snakes, mice or rats. Space in Jane Failing Hall is limited, and applications will be considered on a first-come, first-served basis. For more information on the pet policy, bringing pets to campus or the pet-friendly residence hall, email reslife@linfield.edu. This entry was posted in Latest News, Press Releases and tagged Jane Failing, Kathleen Jensen, pet friendly, Susan Hopp. Bookmark the permalink.